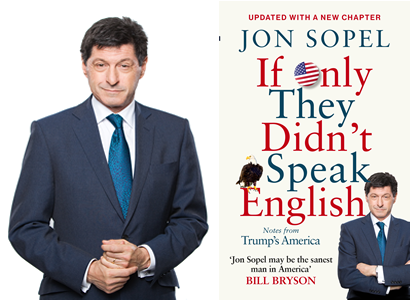 Join us for an evening with the one of Britain’s best known political journalists, Jon Sopel, as he lifts the lid on Trump’s America and paints a fascinating and insightful portrait of American life and politics seen through British eyes. In the time it has taken for a reality star to go from laughingstock to leader of the free world, the BBC’s North America Editor Jon Sopel has travelled the length and breadth of the United States, experiencing it from a perspective that most of us could only dream of: he has flown aboard Air Force One, interviewed President Obama and has even been described as `a beauty’ by none other than Donald Trump. Through music, film, literature, TV and even through the food we eat and the clothes that we wear we all have a highly developed sense of what America is and through our shared, tangled history we claim a special relationship. But America today feels about as alien a country as you could imagine. It is fearful, angry and impatient for change. Jon Sopel lifts a lid on the seething resentments, profound anxieties and sheer rage that found its embodiment in a brash, unpredictable and seemingly unstoppable figure. Jon’s book, If Only They Didn’t Speak English, is our guide to this new America and is published in paperback on 31st May. It includes an extensive new chapter charting Trump’s first year in power. In it he sets out to answer our questions about a country that once stood for the grandest of dreams but which is now mired in a storm of political extremism, racial division and increasingly perverse beliefs. We’re delighted to welcome Jon to Oswestry and look forward to an evening full of insight as he provides his unique perspective of Trump’s America.